seawapa.co: Could Helium-3 really solve Earth's energy problems? Could Helium-3 really solve Earth's energy problems? Helium-3 is slightly different than the gas that fills birthday balloons. Rather, Helium-3 is a stable isotope of helium that is missing a neutron, with this missing neutron allowing for the production of clean energy. The moon holds a tremendous supply of Helium-3 on its surface, but will Helium-3 really be the answer to our energy problems on Earth? Two types of fusion reactions make use of Helium-3 to produce clean energy. The first uses deuterium (deuterium is hydrogen with a neutron) reacting with Helium-3, to produce helium and a proton. The second type of reactions uses two atoms of helium-3 to create helium and two protons. The protons created during the reaction are the crown jewel of Helium-3 fusion. One of the best parts of the proposed Helium-3 reaction is the complete lack of radioactive byproducts. No neutrons are emitted, and no isotopes are left as products that could radioactively decay. The proton is a particularly nice side product, since clean energy can be harnessed from this stray proton by manipulating it in an electrostatic field. Traditional nuclear fission reactions create heat, which is then used to heat water. The boiling water forces turbines to spin and generate energy. In the Helium-3 fusion process, energy is created via the reaction itself, with no nasty radioactive material for future generations to monitor. Helium-3 is transmitted with solar winds, but Earth's magnetic field pushes the isotope away. Thanks to its negligible magnetic field, the moon doesn't suffer from this fate, allowing Helium-3 to build up in regolith, the layer of rock and dust covering the moon. 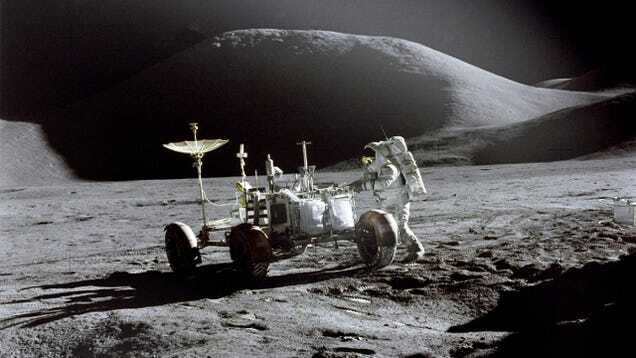 The existence of Helium-3 on the moon is verified by samples retrieved on Apollo and Luna missions. Geologist-turned-astronaut Harrison Schmitt acquired and analyzed over 200 pounds of lunar rock acquired during 1972's Apollo 17 mission. Helium-3 exists on our Earth, but in extremely small quantities. Tritium (hydrogen with a total of two neutrons, or deuterium with an extra neutron if you prefer) naturally decays into Helium-3 over time. Helium-3 is also created, oddly enough, as a byproduct of nuclear weapons testing. The United States' Helium-3 reserves are just shy of 30 kilograms, much less than the theoretical 25 tons of helium-3 necessary to provide for the energy needs of a country our size for one year. After mining lunar rock, Helium-3 is separated by heating the mass to over 600 degrees Celsius, consuming a large amount of energy in the process. And meanwhile, transporting large quantities of Helium-3 back to Earth will be another problem. A spacecraft would likely be able to only carry a few tons of Helium-3 as payload, necessitating a revolving door of shuttles to supply enough Helium-3 to care for the Earth's energy needs. Thus, it's likely that Helium-3 is more likely to become a fuel source for lunar colonies, eliminating a need for start-up additional supplies and costly flights to and from Earth. Due to the effort and energy needed to mine, heat, and transport Helium-3 back to Earth, it will not be a cheap energy source, but a clean alternative, one we might have to turn to in the next 100 years. Frequent trips to the Moon may also open up the lunar tourism industry, as passengers travel along with canisters of Helium-3 destined for use in fusion reactions back on Earth. The first nation (or conglomeration of nations) to establish a Moon colony and begin mining operations will likely set the standard for control of resources on the Moon, especially if exploration of the Western world plays a role as precedent. Let's hope the nation has kind, altruistic motives at hand - otherwise, we might be better off with a private company (as inMoon) making it to the Moon first, with an intention of harvesting its resources. The Russian company Energia claimed in 2006 that it would have a permanent moon base in 2015 and harvest Helium-3 by 2020. But the company appears to be woefully behind in making these claims become reality. A monopoly on clean energy would catapult any major nation into a "ultrapower" - will we see this happen in the next century? Will the first country to create a permanent moonbase share the wealth and help developing nations create a clean energy supply? But even if the Moon's Helium-3 reserves are too expensive to transport back to Earth, our only natural satellite could one day become a space-faring "gas station" for vessels traveling into space, as humanity takes to the stars. Top image courtesy of NASA. Helium-3 reaction diagram courtesy of the Artemis Project. Additional image courtesy of Sony Pictures. Sources linked within the article.